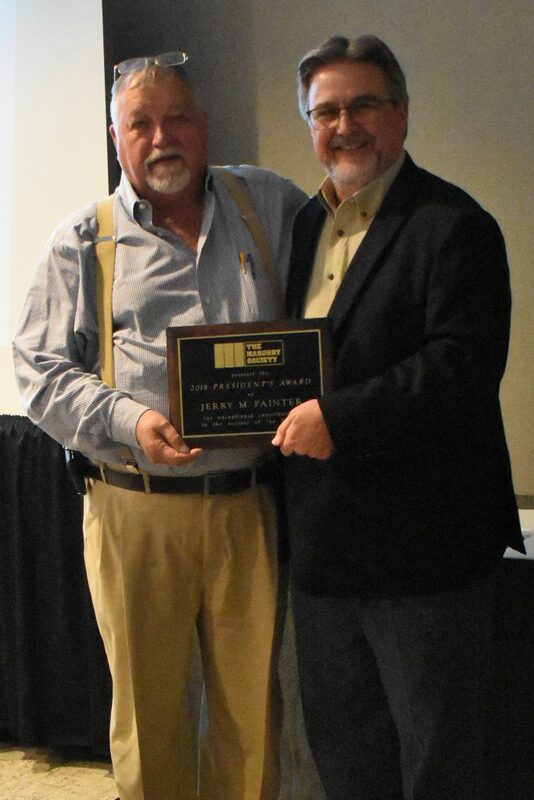 Jerry Painter, Masonry Consultant and Owner of Painter Masonry, was awarded the 2018 President’s Award at The Masonry Society’s 2018 Annual Meeting in Cleveland, Ohio. TMS President, Darrell McMillian selected Jerry Painter selected his exceptional contributions that have led to the success of the Society. McMilllian noted that he watched and learned from Painter since McMillian started in the industry. During the presentation, McMillian thanked Painter, that no matter where it was, ASTM, local and national contractor groups, and of course at The Masonry Society, Painter was always striving to “raise the line!”. McMillian expressed his thanks to Painter for his service in leading the Society, serving as liaison for the recent Masonry Educator’s Workshop, offering a contractors perspective on many TMS Committee, and educating. Painter is a member of TMS 402/602, the Design Practices Committee and many other committees within TMS. Outside of TMS, he is a recognized expect, and has received many prestigious awards for his contributions. He is a champion for masonry, and the industry’s best ambassador on its benefits.